Dolin blogs about her creativity and crafts at her blog Lulu Bliss. Drop by to say hello! as someone who knows her well, she lives on that bike. Glad to see that I am not the only one not driving. I am froom Paris and it’s crazy to drive there. Same here I have a DL but never used it I rely on public transportations which is an easy thing to do here or in Europe. 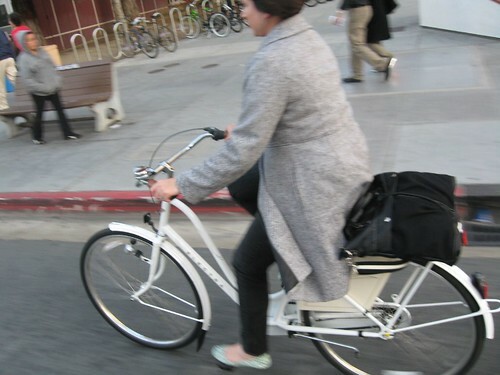 Can Dolin please tell us where she bought her bicycle? I just discovered that Electra is now making these (where have I been?) and they seem like a big value compared to Velorbis and Retrovelo. I live in Saratoga and my husband and I ride all over the place but we haven’t passed by anyone on a Dutch or Danish-inspired upright bike….And I LOVE them! I just hope you can convert them to Xtracycle….. 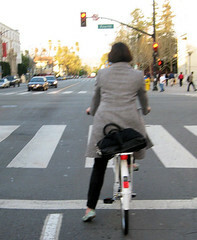 I know Dolin bought hers at Montano Velo on Piedmont Avenue in Oakland. (Pretty sure). Last i checked, they had a black one down there. Steph, REI carries Electra bikes, though I don’t think I’ve seen the Amsterdam at the San Jose store on Saratoga by Hamilton.